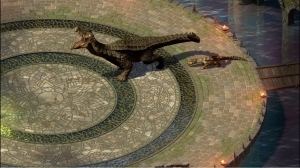 The next major DLC to come to PIllars of Eternity II: Deadfire was revealed during their panel during PAX West. The paid DLC will be called “Seeker, Slayer, Survivor” and releases on September 13th. Challenges, puzzles, and deadly adversaries await in this update, alongside bug fixes and balance improvements. Combat trails the likes of which players have yet to see will be available in the Crucible. “Seeker, Slayer, Survivor” is heavily focused around combat with a wide variety of deadly adversaries’ hell bent on destruction as players face down everything from dueling wizards to regenerating spiders. Based along three pillars of combat, the DLC will challenge Deadfire players in a new way. Choosing the Seeker, combat tasks players with looking for a solution to take down their foe, while the Survivor has combat that challenges fighting skills against waves of enemies, and finally the Slayer puts players in combat that will see their party go up against some truly fearsome creatures in a battle to the death.